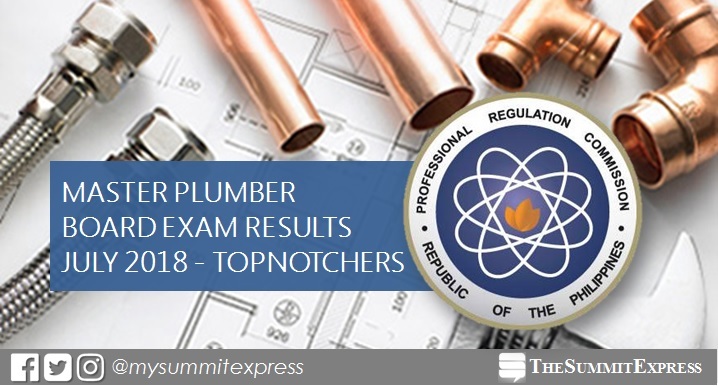 MANILA, Philippines – The full list of topnotchers or top 3 passers in the July 2018 Master Plumber board exam is available on this page as officially released on Wednesday, July 11, 2018 or in three (3) working days after the exam. PRC and the Board for Master Plumbers conducted the licensure exam in Manila, Baguio, Cagayan De Oro, Cebu, Davao, Iloilo, Legaspi and Tacloban on July 7 (Saturday) and 8 (Sunday). In the July 2017 exam, Mapua Institute of Technology (MIT) - Manila graduate Kim Aldrin Sarra Mejia topped the board with 82.20%. It was followed by Richard San Luis Garcia from Technological University of the Philippines (TUP) - Manila and Jerod Bariquit Ravago of University of San Carlos (USC), both having 81.60. In the July 2016 exam, Feliciano Maddawin Galupo Jr. from Isabela State University- Ilagan aced the licensure exam with 83.80%. Bicol University- Legazpi alumnus Jerome DioQuino Balanoyos ranked second with 82.60%. Monitor this page for the real-time updates on Master Plumber board exam result. Check out also the official website of PRC for more information.